​I have been honoured to perform over 320 weddings and dozens of other types of ceremonies since becoming a celebrant in 2003. Here are the things that just some of my past clients have said about me and my celebrant services. I'm thrilled to say that I have never had a client who was unhappy with my services. "Sharon, I am finally getting round to writing all my thank you emails and you were of course the first on the list. I wanted to send you a "proper" card but I have felt prompted to send you this now just because o the amount of phone calls and cards we have been getting from people saying what a wonderful and amazing day it was... How the actual day turned out really did exceed our expectations. Everything was just perfect and I couldn't have wished for more... I can't thank you enough for making the most important day of my life also the most wonderful." "Hi Sharon, thank you so much for you special words, your hard work and your kind manner throughout our planning and execution of the wedding. What a wonderful day we had, we find ourselves being hard pressed to wish for anything different. We had the best day ever and thank you from the bottom of our hearts for being a part of it and providing an amazing experience." "We just wanted to say thank you again for all you did for us leading up to the ceremony and on the day. We were so impressed by your services and everyone thought the ceremony was beautiful. So thanks again, Sharon!" "An absolutely AWESOME celebrant. Sharon married my husband and I on the hottest day of the year in December 08 when we also got a huge storm - being an outdoor wedding she had to hurry the words. She not only made everyone laugh with her good humour of the storm but she also did another certificate up because she didn't want us to have a certificate ruined by rain drops." "Well, where do I start? Paul and I would like to thank you for being the person up there with us. We couldn't have chosen a better person as you allowed us to be ourselves and have the ceremony we wanted... We received comments on the style of ceremony we had and the content involved in what was said during the ceremony... It was exactly what we wanted and we can't thank you enough." "Sharon, thank you so much for making our special day perfect. Everything you did from start to finish was truly professional and in doing so you gave us the romantic, special wedding we wanted. September 13th 2008 is a day we will never forget, thanks to you and our wonderful family and friends." "Sharon, thank you so much for braving the elements of nature for our daughter's naming day. The ceremony was lovely despite the weather being cold and wet. We appreciated your kindness and thoughtfulness from beginning to end. Thank you!" "We could not have asked for a better celebrant. Sharon exceeded our expectations in so many ways, not least was the inclusion of our families in the ceremony, which was so important to us. We highly recommend Sharon as a Wedding Celebrant." "Thanks so much for everything, Sharon. You made everything so easy. One thing we did worry about as writing our ceremony but you fixed that with your first visit. We had a great day and are really appreciative of all your work. The kids loved the certificates and thanks for the copy of the ceremony." "Thank you again for helping to make our day as wonderful as it was. It would not have been the same without you." "My wife and I were married by Sharon not long ago and we could not be happier with the service she provided. Although every wedding has a hitch or two, Sharon handled this with extreme professionalism and a great sense of humour. My wife and I hould have no hesitation in recommending her to anyone looking for a celebrant." "Apologies for this late email, to say thank you for conducting our wedding. Our day was perfect and every one commented on how beautiful the ceremony was. We really appreciate the words you wrote for us, they meant so much to both of us. Once again thank you for a wonderful ceremony and all the best for the future." "Thank you for all your hard work and kindness that made our day extra special." "Thank you for everything on the wedding day. It was perfect." "Thanks so much for everything you've done towards making Mum's [funeral] service lovely for her, and especially for me. All the very best to you." "We wanted to send you a quick note to tell you how thankful we were for the beautiful ceremony you performed for our wedding, and especially helping us with the overseas requirements and meeting us in the city to sort it all out before we left for home. Thanks again and all the best!" ​"Thank you, Sharon. We were more than happy with your service as a celebrant." "From the moment that Shaun and I met Sharon we felt at ease, for such a big day we knew that our choice in a celebrant had to be 'just right'. The assistance that Sharon gave us was invaluable. The professional yet warm way in which the ceremony was conducted made Shaun and I relax a lot !!! All of our guests commented how nicely presented the ceremony was. A big thanks Sharon, for making our day that extra bit special." "Sharon, you did a wonderful job - very much appreciated. We had many positive comments about the ceremony. We also thought your presentation of our commemorative personal copy of the ceremony was a lovely and thoughtful touch that neither of us received in our previous weddings." "Sharon, we wanted to say thank you so much for our son's naming ceremony. It was beautiful, and you made it something special for us to remember. Our older boys have treasured their certificates and found a special place for them in their rooms. Many thanks." "Everything was PERFECT. It is a night we will never forget. 100% + 10%!" "Thank you very much for making our wedding day beautiful." "Sharon, you are truly wonderful! The ceremony you wrote for us was perfect - people are still talking (and it has been three weeks). There was not a dry eye afterwards. The experience you show, the materials provided and delivery of the ceremony exceeded all expectations. You made it a day we will never forget. Thank you so very much!" "Thank you once again for the beautiful wedding ceremony and for being a part of this journey with Jake and me. We admire your patience when we weren't always on the ball." "Dear Sharon, thank you so much for making our day such a memorable occasion. It was very personal and your delivery was very professional. We will always remember you, please keep in touch." "We wanted to say thank you again for writing and performing such a beautiful ceremony for us. You really went the extra mile for us and we feel lucky to have had someone who clearly cared so much about marrying us." "You knew exactly what we wanted and even though we said we didn't want any extras, the blessing of our hands was a great touch we wouldn't have thought of. You are a strong and compassionate person who delivered the ceremony beautifully. We couldn't have asked for anything better." "Thank you for your help in creating such beautiful wedding ceremony. All of our guests commented on how wonderful the afternoon was. Thank you for helping us move to the next phase of our life together with such beautiful words. It was a wonderful ceremony and a memory we will cherish for a lifetime." "You nearly made both of us cry during the ceremony. Your words really touched us. Mum loved it - said you did us justice. Thanks so much!" "Sharon was nothing short of sensational for the ceremony, as well as before and after. Her preparation was brilliant and she welcomed feedback. Awesome, all the way!" "You did a great job. Thanks very much for making our day wonderful." "Thank you, Sharon, for making our day so special." "Thanking you for your professional services in making my mum's farewell a beautiful and memorable occasion. Your sincere condolences have also been very much appreciated during our sad and difficult time." "Sharon, thank you so much for conducting our "perfect" wedding ceremony. You went above the call of duty with everything, especially the certificates you prepared for the kids. They were a lovely surprise and the perfect keepsake. Thank you!" "Sharon, thank you for making our special day truly delightful." "We would just like to thank you SO much for the perfect ceremony on Saturday! It was exactly what we wanted and you did such a beautiful job. You made us all feel comfortable and at ease. The rest of the evening went exceptionally well and we had a great time. We are so happy with everything about our wedding day and we feel that you made a huge part of that day special. Thank you once again." "We just wanted to say a big thank you for all the work that you did on the day and leading up to it. We gratefully appreciated it and you did a great job." "Sharon, thank you so much for our perfect day! It was everything we wished it could be. Love from"
"Sharon, thank you so much for helping us to celebrate our daughter Harper-Rae's Naming Day. It was a beautiful day which everybody enjoyed. We will be sure to contact you fo rour next child's Naming Day in the future." "Sharon, Thank you for marrying us. You made our day special. You are a wonderful celebrant and we would recommend you to anyone! Hope you enjoyed your wine and thank you again for letting us borrow your PA system." "Dear Sharon, Our heartfelt thanks for all of your effort in preparing our wedding ceremony. Your professionalism and warmth on the day made our wedding all the more beautiful. With best regards,"
"Dear Sharon, Thank you so much for the beautiful ceremony you created for us. It was beautiful. From what I've been told, there wasn't a dry eye in the house." "To Sharon, Thank you so much for conducting our wedding ceremony. It was perfect and very sincerely performed. We will be speaking your praise for a long time to come." "Losing both mum and dad in the space of three weeks - it was the hardest three weeks of my life. Christmas and New Year will never be the same for my family. Thank you so much for your kindness and professionalism during this time, and for making yourself available to do both ceremonies. It has meant so much to my sisters and me." "To Sharon, Thank you so much for giving us such a lovely ceremony, and for the care you took with everything. We had a lovely day - thank you for being part of it." "Dear Sharon, Thank you so much for braving the elements of nature for our ceremony. It was lovely despite being cold and wet! We appreciated your kindness and thoughtfulness from the beginning to end. Thank you!" "Dear Sharon, Thank you very much for making our night a success. No one expected the surprise wedding right after the reaffirmation ceremony. Both ceremonies were excellent!" 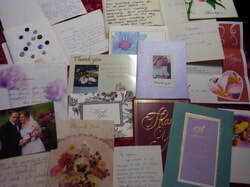 "Dear Sharon, This is just a note to say thank you for helping to make our wedding day special and memorable. Our ceremony was everything we had hoped for." "Sharon, those candle and flower rituals you performed at Dad's funeral were so beautiful. My uncle was standing at the back of the chapel and all he could hear was the people around him expressing their appreciation at what you were doing." "Dear Sharon, We would like to thank you for creating and presenting such a wonderful wedding ceremony and handfasting. Thank you for all of your homework which produced a fantastic pagan ceremony and handfasting which was just lovely and personal. It was magnificent of you to have written our puppy Winston into the ceremony as well. We just can't thank you enough for going the extra mile to create our ceremony." "Sharon, we picked up our wedding certificate today and got the Apostille as planned. No problems at all. We would like to thank you very much for all the assistance and for the wonderful wedding on the beach. Tomorrow we will leave your wonderful country and spend the last two days of our holiday in Bangkok." "Tom and I just wanted to say thank you for writing and performing such a beautiful ceremony for our wedding. We were really happy with the way everything went on the day. It was just perfect." "Just wanted to thank you again for an awesome job on Saturday 19/9/09. We had such an awesome day/night and everyone has been commenting on the beautiful job you did on the ceremony. So thanks for everything!" "Just wanted to say thank you for doing our wedding, and what a lovely wedding it was. It was wonderful, the best wedding we have ever been to. So many guests commented on how lovely it was and that it was the best wedding they had been to. It was so relaxed (apart from Pete crying, LOL, he is so cute!). Seriously, it was so much fun, exactly the wedding we wanted, perfect. Thanks again,"
"Thank you for such a lovely ceremony on Saturday!" "Thank you so much for the lovely service. The day was so good, but over so quickly. Also, thank you for the book for Ollie. I will be recommending you to people!" "Just a short note to say our sincerest thanks for the beautiful ceremony you developed for us. It surely did make our wedding day extra special. You were also very helpful in providing us with brochures, forms, and answering questions we had. And the certificate you provided is a treasure to keep. We couldn't have asked for anything better."